High Efficiency Off-Line Filtration Systems are ideal for achieving and maintaining target fluid cleanliness in bulk oil and fuel storage tanks. FSL skids feature oversized filter assemblies to optimize single pass efficiencies to hit Target ISO Codes whether you are re-circulating tank fluid or dispensing. Dedicated filtration and breathers on bulk storage tanks for lube and hydraulic oils and stand-by diesel fuels is the first line of defense in preventing one of the worst sources of particulate and water contamination, new fluids. Bulk storage tanks collect contaminants from delivery vehicles and through ineffective breather arrangements. 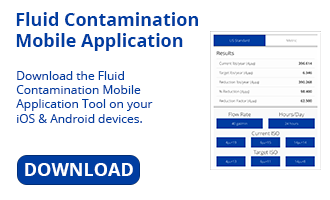 Eliminate this dangerous source of contamination and before transferring new fluids into critical operating systems. Filter Carts are also a valuable tool for keeping fluids clean when transferred from storage to critical live systems. Customizable designs are available to satisfy any bulk oil contamination challenge. Vac-U-Dry Vacuum Dehydration Oil Purifiers. Reclaimed fluids from sumps or contaminated fluids removed from service can be restored to useable condition by removing particulate and water contamination. Hy-Pro Vacuum Dehydrators rapidly remove free and dissolved water to < 10ppm while on-board high efficiency filtration elements featuring media down to 1 micron absolute rapidly reduce ISO Codes. Vacuum Dehydrator flow rates available up to 60 gpm / 225 lpm and viscosity range up to 680 cSt. Water sensor reporting in percent saturation and optional on-board particle monitor let you know when the fluid is dry and clean. For oils only needing particulate removal Hy-Pro Filter Carts for hydraulic or lube viscosity grade oils can handle flow rates up to 22 gpm / 82 lpm and higher with custom design flushing skids with or without heat. Applications include traditional hydraulic and lube oils, phosphate ester, and even used motor and crankcase oils. COD Diesel Fuel Particle & Water Coalesce Conditioners rapidly particles and water with > 97% single pass efficiency to ensure that fluids in emergency stand-by reservoirs are clean and dry so hospital and other emergency response generators start when needed.